Summers almost here and that means another year of EA’s College football with new gameplay ti wicks and promise of more improvements EA plans to step it up for the new year! 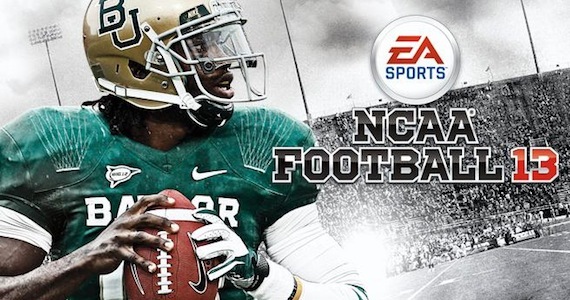 Passing is more important than ever in the realm of collegiate football, and NCAA Football 13 has taken great strides to give users unparalleled control over this element of the game. Total Control Passing allows quarterbacks to lead their receivers into open space, and reconfigured passing trajectories to allow QBs to drop their passes in between layers of coverage without leading receivers out of bounds and while also maintaining a realistic throwing velocity. Receiver Awareness – All those times when you’d complete a pass well before the receiver completed his route? You’re not going to be doing those as much if EA has its way. This year, the icons over receivers will light up when a player is expecting a pass. This doesn’t mean he’s open. This just means the receiver is looking for the ball. Similarly, you can throw when the icon isn’t lit up, but the chances of a catch are lower. 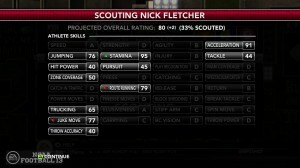 Passing isn’t the only revamped element of NCAA Football 13; pass coverage has been overhauled as well. Gone are the days of “Psychic DBs” and “Super Linebackers,” as the new Read & React Defensive AI system requires defenders to see the ball before they make a play on it. This means defenders will react in a much more realistic manner, only making plays on the ball when they actually see it in the air. Now well-executed pump fakes or play action plays are more dangerous than ever, and defenders who lose track of the ball will be hard-pressed to contain their offensive counterparts. Studio Updates and ESPN Bottom Line bring you the stories of Saturday, featuring live studio updates from earlier matchups and games in progress. Kirk Herbstreit, Brad Nessler, Erin Andrews and now Rece Davis of ESPN provide authentic and enhanced commentary on all the action. In addition, recruiting now goes deeper than ever with updates to dynamic pitches. 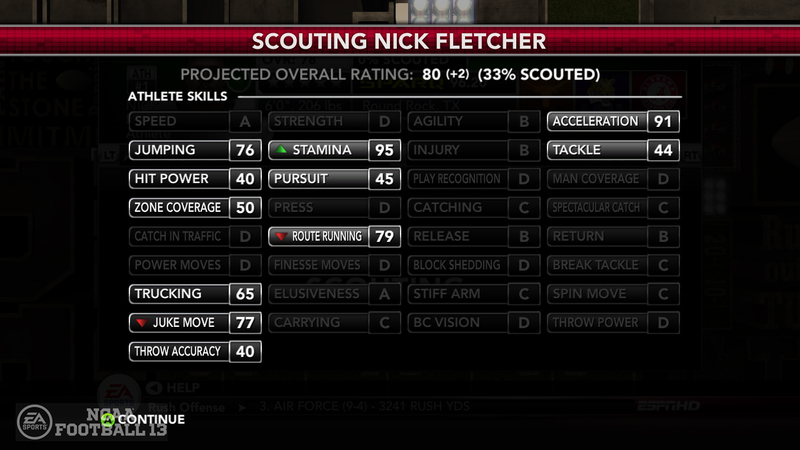 For the first time, recruiting grades can change each week based on your performance in Dynasty mode. The implementation of the ESPN Bottom Line ticker will keep fans up-to-date throughout the NCAA Football 13 Dynasty experience, with a new simulation process that now evaluates games being played in real time before and during a game. Priority Score Alerts, Final Alerts and Upset Alerts will be displayed just as they do during game day broadcasts. The new scouting feature provides fans a detailed experience while scouting a new recruiting class. Starting in the pre-season, each coach will have an allotted amount of time to scout players and determine attributes to unlock their overall rating, gaining familiarity and knowledge about their players’ abilities in the regular season. 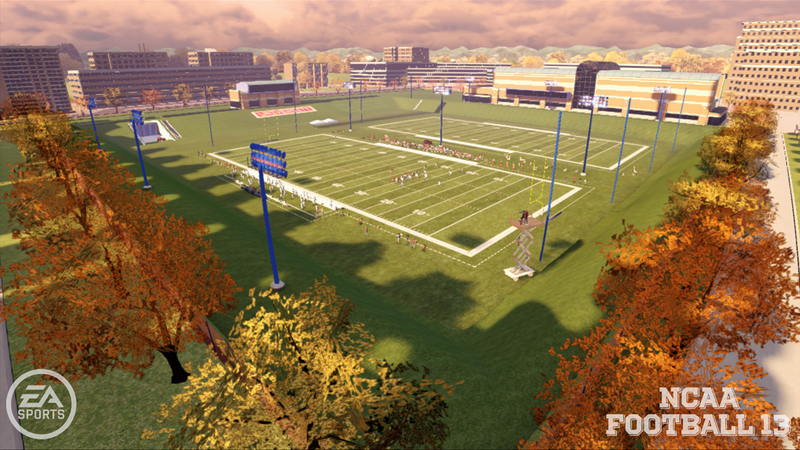 Recruiting pitches have been updated to include dynamic grades, allowing users to improve their University ratings and sell their school to top prospects through the influence of various actions in Dynasty Mode. 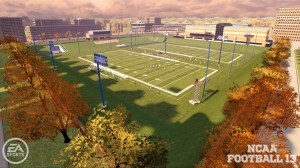 Fourteen unique pitches have been created to reflect certain categories in Dynasty and will be updated continuously, including Championship Contender, Coach Prestige, Coach Stability, Conference Prestige, TV Exposure, Pro Potential, Stadium Atmosphere, Playing Style, Program Tradition, Playing Time, Proximity to Home, Academic Prestige, Athletic Facilities and Campus Lifestyle. 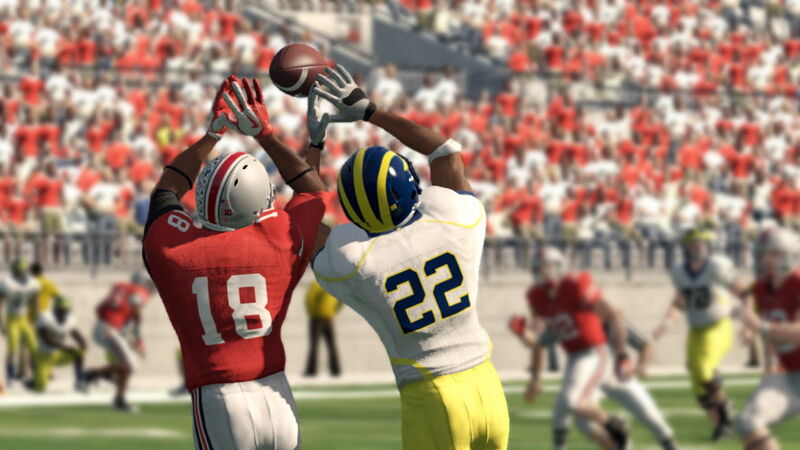 Revel in the pageantry of college football game days with NCAA Football 13. 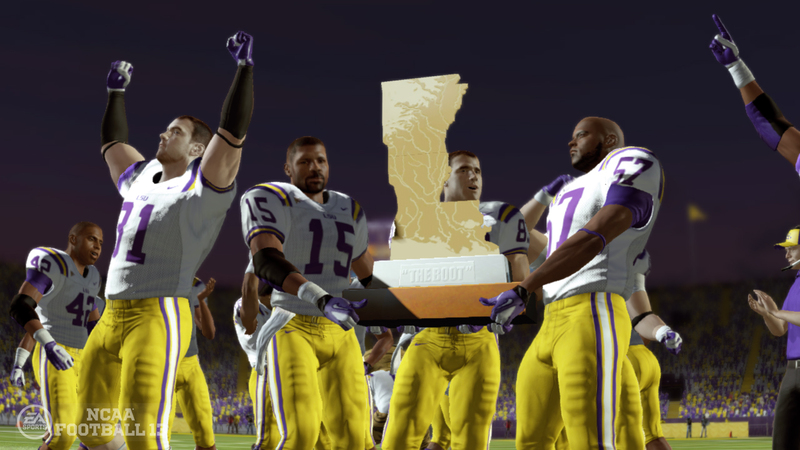 Featuring new team run-outs, mascots and pre-game traditions along with significantly enhanced audio and new trophy presentations, NCAA Football 13 will deliver the passion and excitement of college football to fans across the nation. With new trophy presentations, motion blur rendering, progressive lighting and an expanded broadcast presentation, NCAA Football 13 brings a defined sense of realism to light up game days. Pre-game traditions feature several new schools, including. The NCAA Football 13 audio team sent audio directors and designers to more than 20 schools across the nation to capture the energy of game days, recording new crowd chants and stadium buzz. Commentary has been improved with genuine dialogue and unscripted banter between Kirk Herbstreit and Brad Nessler, following a new recording process that blurs the line between virtual football commentary and true broadcast presentation.